The Disney-Pixar film Coco is going to be a big hit during the post-Thanksgiving period, and critics are already calling it one of the best animated films of the year. 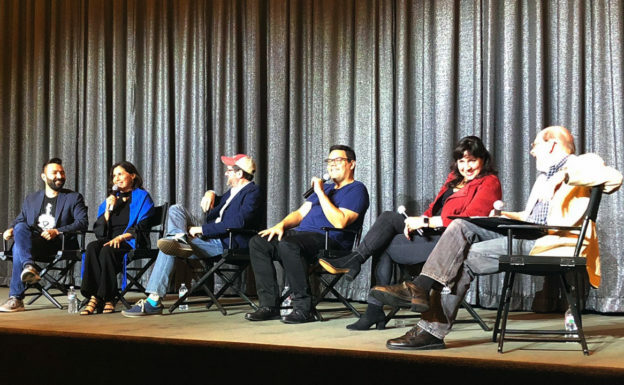 It was an honor to be asked to interview the entire Coco music team Thursday night after a Society of Composers & Lyricists screening at the Pacific Design Center. L to R in the photo: co-director, co-songwriter and writer Adrian Molina; songwriter and orchestrator Germaine Franco, whose Mexican-American heritage became a big factor in achieving an authentic sound for this “Day of the Dead”-themed story; composer Michael Giacchino, whose previous five Pixar films include Ratatouille (an Oscar nominee) and Up (an Oscar winner); songwriters Bobby Lopez and Kristen Anderson-Lopez, whose “Remember Me” is certain to be short-listed for awards this season; and yours truly. A memorable evening. This entry was posted in and tagged Adrian Molina, Bobby Lopez, Coco, Disney-Pixar's Coco, Germaine Franco, Kristen Anderson-Lopez, Michael Giacchino, Pixar's Coco, Society of Composers & Lyricists on November 11, 2017 by Jon Burlingame.